Vakrasana is also called Twisted pose or Half Spinal Twist pose. The practice of Vakarasana (वक्रासन – Vakrasana in Hindi) makes the spinal column more flexible. This asana stimulates spinal nerves. It has a strong impact on the abdominal muscles by alternately stretching and compressing them and thus enhancing the pranic flow in the region. Vakrasana is a Sanskrit term in which “Vakra” means “Twisted” and “Asana” means “Pose”. This asana removes fats around the waist. Vakrasana is a simplified form and a preparatory Yoga Pose of Ardha Matsyendrasana. Spread a Yoga Mat and sit with your legs outstretched with feet close to each other but not touching. Place your palms on the floor by the sides, behind the buttocks, fingers pointing backward. Bend your left knee and place the sole of the left foot near the right knee. Twist your trunk towards the left and bring your right hand forward and place it on the outer side of your folded left knee. Your right elbow will be touching the left knee. Place your right hand over the left foot or you can even hold the left ankle with your right hand. Turn your head to your left and place your left hand flat on the floor, just behind the hip. Hold this position for a count of 30 seconds or as long as you are comfortable, breathing normally. Those suffering from any injury of the hips, shoulders, and neck should avoid this asana. Vakrasana stretches the spine, loosens the vertebrae and tones all the spinal nerves. 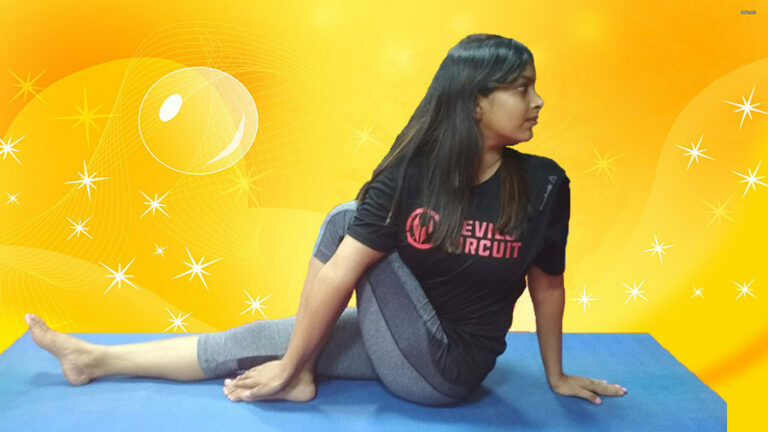 Vakrasana helps to remove excess fat around the waist. It strengthens back muscles and reduces a backache. Since it stimulates the pancreas, Vakrasana is beneficial for people with diabetes. This asana regulates the secretion of digestive juices useful for different digestive disorders. Vakrasana, a simple Spinal Twist Yoga Pose, is a great Asana for the beginners, as it prepares them for more difficult Twisting Yoga Poses, including Ardha Matsyendrasana. This asana should be practiced after forward and backward bending asanas have been practiced and before the inverted asanas (inversions).